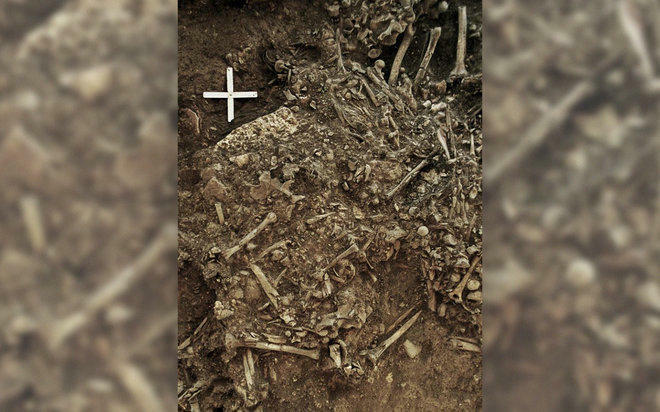 In a nearly 5,000-year-old tomb in Sweden, researchers have discovered the oldest-known strain of the notorious bacterium Yersinia pestis — the microbe responsible for humanity's perhaps most-feared contagion: the plague. The finding suggests that the germ may have devastated settlements across Europe at the end of the Stone Age in what may have been the first major pandemic of human history. It could also rewrite some of what we know of ancient European history. The finding came about as the researchers were analyzing publicly available databases of ancient DNA for cases in which infections might have claimed prehistoric victims. They focused on the previously excavated site of Frälsegården in Sweden. Previous analysis of a limestone tomb at the site found that an estimated 78 people were buried there, and they all had died within a 200-year period. The fact that many people died in a relatively short time in one place suggested they might have perished together in an epidemic, lead study author Nicolás Rascovan, a biologist at Aix-Marseille University in Marseille, France, told Live Science. The limestone tomb was dated to the Neolithic, or New Stone Age, the period when farming began. By comparing the newfound strain with known plague DNA, the scientists determined that the ancient sample was the closest known relative of the plague bacterium's most recent ancestor. The study researchers theorized that the ancient sample diverged from other plague strains about 5,700 years ago. The new findings contradict an older theory about how plague spread, according to the researchers. About 5,000 years ago, humans migrated from the Eurasian steppe down into Europe in major waves, replacing the Neolithic farmers who lived in Europe at that time. Previous research had suggested the steppe folk brought the plague with them, wiping out pre-existing settlements upon their arrival. However, if the plague specimen from the Swedish grave diverged from other strains 5,700 years ago, it likely evolved before the steppe migrations began — suggesting it was already there. Rather, the researchers suggested that the plague emerged in so-called mega settlements of 10,000 to 20,000 inhabitants that existed in Europe between 6,100 and 5,400 years ago. These mega settlements — up to 10 times larger than previous European settlements — "had people, animals, and stored food close together, and, likely, very poor sanitation. That's the textbook example of what you need to evolve new pathogens," senior study author Simon Rasmussen, a computational biologist at the University of Copenhagen, said in a statement. If plague evolved in these mega settlements, "then when people started dying from it, the settlements would have been abandoned and destroyed. This is exactly what was observed in these settlements after 5,500 years ago," Rasmussen said. Plague then could have spread across trade networks made possible by wheeled transport, which had expanded rapidly throughout Europe by that time, Rascovan said. Eventually, it would have made its way even to relatively distant sites like Frälsegården in Sweden, where the woman the researchers analyzed died. That woman's DNA revealed she was not genetically related to steppe folk, supporting the idea that this ancient strain of plague arrived before the migrants came from the steppe. Indeed, it's possible that "the revolutionary innovations of that time — bigger settlements with more complex organization, wheeled transport, metallurgy, trading networks over large distances, and so on" — may have set the stage for "the emergence and spread of infectious diseases, and this eventually led to, what we think, was the first massive pandemic of human history," Rascovan said. The researchers noted that the findings don't mean that plague single-handedly wiped out Neolithic settlements, but rather that it may have been one factor among others, Rascovan said.For instance, the Neolithic settlements may have overexploited their environment, potentially driving forests they depended on into extinction, the researchers said. The researchers also cautioned they have not yet detected the smoking gun for their new theory — that is, plague in any remains from the mega settlements in which it may have evolved. "If we could find plague in those settlements, that would be strong support for this theory," Rasmussen said in the statement. The findings were published online Dec. 6 in the journal Cell.